← Traveling with Cloth Diapers or Hybrid Diapers? 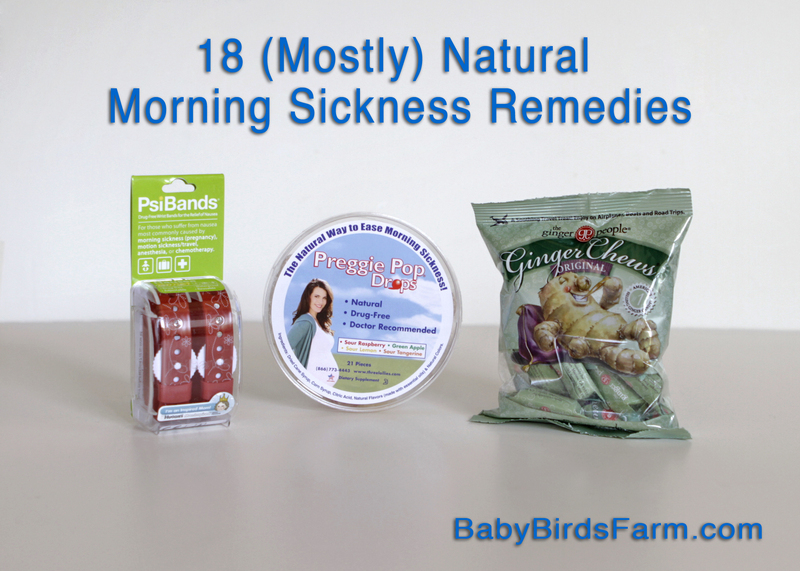 This entry was posted in Green Parenting, How To, Natural Remedies, Parenting, Pregnancy and tagged morning sickness, Natural Remedies, Pregnancy. Bookmark the permalink. What a great list! I was lucky throughout my three pregnancies to have minimal morning sickness. I found “eating like a toddler”, & simply avoiding smells and tastes that bothered me helped a lot. Thanks Lori! That is a good tip to avoid the smells and tastes that bother you. Congratulations first of all! And, I wish I would have known some of these tips when I was experiencing super crazy morning sickness a few months ago! Best of luck with your pregnancy! xoxo. Thanks so much Angela and congratulations to you!! Congrats on your pregnancy Abby! How fun that you’ll have two beautiful girls :) I’ve actually tried those ginger chews from tj’s but didn’t like them at all :( which is surprising since I pretty much like everything from tj’s! Anyway, I love Reed’s ginger brew for nausea. It helps every time! Thanks Jennifer! The candy is spicy, it’s not for everyone. I’m glad the ginger brew helps you! My husband loves them for cocktails, lol. HI Abby! I’m not pregnant, but tend to get motion sick very easily. I hope to never have to suffer from morning sickness, but I am keeping a mental list of your suggestions just in case!! Marcy, I also get morning sickness really easily. In fact, I remember being the pukey kid on a middle school desert trip. I think your husband may have been in the same van as me! Jolly ranchers actually totally makes sense. Congrats! Preggie pops, small meals and ginger ale helped me a little. Zofran helped a lot. I want to try the bands and acu next time though. Sounds like me this first time, Miranda. Hoping your second is also easier. I’m really interested to try those bands! Great for the busy pregnant mom on the go. I just found out I’m pregnant with number 2 and so far I have only had minor nausea. I have just been munching on crackers to keep something in my tummy. Never had it with my first pregnancy! Best of luck to you Lani. Yes, I agree, I think a man came up with the name morning sickness. Congrats on your upcoming baby bird! Hi Tasha, congrats to you, too! I hope you start feeling better soon. My morning sickness was so bad with my first pregnancy that I couldn’t even keep water down. It was horrible. I had to talk Zofran for 7 weeks just to function. Given all that, I would use everything pictured for the next pregnancy from the start to hopefully give myself better chances. Maybe you will be like me and find the second time easier! I wish I had this list 3 months ago! Would have loved to try the bands. I’m glad you are passed the worst of it! I wish I’d tried some of these with my first, but I’d love to try them the second time around! Congrats on your pregnancy! I was lucky enough to have minimal morning sickness. I just didn’t like onions and garlic on anything! I love ginger, so I’d try the ginger chews. Thanks Aline! No one is stopping you from eating the candy like, well, candy. I love the Gin-Gins hard candy. I always bring some with me when I fly since I tend to get motion sickness. The gin-gins are yummy! I used the psi bands flying way before I was ever pregnant. I have been so sick this pregnancy. I would LOVE any of those products. Thanks for the suggestions and this giveaway. You are welcome Tamara. I’m so glad this post has been of help! I hope you start feeling better soon. And congratulations Tamara, you are our winner! I will get in touch with you regarding getting your goodies to you! Ooooh great list! I’ll be sharing with my sister who is having some bad morning sickness! This is a great list!! I hope you feel better soon, congrats on your second baby bird. We are hoping to add to our nest soon, too. With my first, I was nauseated the first trimester, and preggie pops worked well- but not all the flavors. I also sucked on lemon jolly ranchers. I would love to try the psi bands and the ginger candy, too. I love ginger! Good luck to you, Kari! I want to try the psi bands! Would be totally helpful, as I’m 6 weeks along with #2 and feel sick mostly at night when I don’t really want to be eating anything! Thanks for the giveaway! Thanks to everyone who entered the giveaway. Congrats to our winner Tamara! Although the giveaway is closed, please continue to share your tips and questions! Love that tea recipe, Joann!